Bosnia and Herzegovina is a republic of the western Balkans Peninsula of Southern Europe that is home to three ethnic constituent peoples: Bosniaks, Serbs and Croats. Croatia borders the country on the north, west, and south, Serbia and Montenegro on the east and southeast, and the Adriatic Sea on the southwest. The country's name comes from the two regions Bosnia and Herzegovina, which have a vaguely defined border between them. Bosnia occupies the northern areas which are roughly four fifths of the entire country, while Herzegovina occupies the south part of the country. The country consists of two political entities, the Federation of Bosnia and Herzegovina and Republika Srpska, with District Brčko as a de facto third entity. 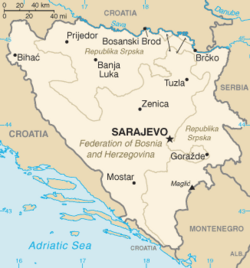 Formerly one of the six federal units constituting the Socialist Federal Republic of Yugoslavia, Bosnia and Herzegovina gained its independence during the Yugoslav wars of the 1990s. Map of Bosnia and Herzegovina. Dianthus flower from central Bosnia. View of Kik Mountain (right), 1,000 m (3,280 ft); and Rance (Suvi Vrh) Mountain (left), 1,432 m (4,698 ft). 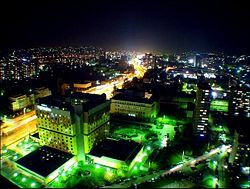 City of Sarajevo at night. The name "Bosnia" most probably comes from the name of the Bosna river around which it has been historically based, which was recorded in the Roman Age under the name Bossina. Herzegovina means Herzog's lands after Stefan Vukčić Kosača who in 1448 called himself Herzog of Saint Sava. The name "Herzegovina" was first included in the official name of the then Ottoman province in the mid-nineteenth century. With an area of 19,741 square miles (51,280 square kilometers) the country is slightly smaller than West Virginia in the United States. The country is mostly mountainous, encompassing the central Dinaric Alps and numerous ranges, including the Plješivica, Grmec, Klekovaca, Vitorog, Cincar, and Raduša, which run in a northwest-southeast direction. The highest point, reaching 7828 feet (2386 meters), is Maglic, near the Montenegro border. A karst region of arid limestone plateaus containing caves, potholes, and underground drainage, is located in the south and southwest. Karst uplands can be bare as a result of deforestation and thin soils, but valleys have alluvial soil suitable for agriculture. Central Bosnian terrain has rugged, green, and often forested plateaus. The northeastern parts reach into the Pannonian basin, while in the south it borders the Adriatic Sea, with beaches that attract tourists. The country has only 12 miles (20 kilometers) of coastline, around the town of Neum in the Herzegovina-Neretva canton, although enclosed within Croatian territory and territorial waters, with no natural harbors. 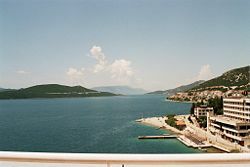 Neum has many hotels and is an important tourism destination. Natural resources include coal, iron ore, bauxite, copper, lead, zinc, chromite, cobalt, manganese, nickel, clay, gypsum, salt, sand, forests, and hydropower. The Dinaric Alps cut Bosnia and Herzegovina off from the climatic influence of the Mediterranean Sea. The climate in Bosnia is mild, though bitterly cold in winter. In Banja Luka, the January (winter) temperature averages 32°F (0°C), and the July (summer) temperature averages about 72°F (22°C). Rain falls least during January and February in Banja Luka, and most in May and June. Herzegovina can be oppressively hot in summer. In Mostar, near the Adriatic coast, January, averages 42°F (6°C), and July averages about 78°F (26°C). There is a relatively dry season from June to September, while the heaviest precipitation is between October and January. There are seven major rivers: The Sava river, the largest river and a tributary of the Danube, flows through Serbia, Bosnia and Herzegovina and Croatia, and makes a natural border with Croatia. The Sana is a tributary of the Sava in the north. The Bosna, Vrbas, and Una, flow north and empty into the Sava. The Drina, which flows north the eastern part of Bosnia, forms part of the eastern boundary with Serbia, and is a tributary of the Sava. The Neretva river flows through the karst region, continues through Croatia, and south, through the famous city of Mostar, to the Adriatic Sea. Close to 50 percent of Bosnia and Herzegovina is forested with pine, beech, and oak. Fruits are common, including grapes, apples, pears, and especially plums, which are made into thick jam and slivovitz, a brandy. Northern Bosnia contains fertile agricultural land along the river Sava and the corresponding area is heavily farmed. This farmland is a part of the Parapannonian Plain stretching into neighboring Croatia and Serbia. The country's wildlife includes bears, wolves, wild pigs, wildcats, chamois, otters, foxes, badgers, and falcons. Hunting is a popular pastime. Destructive earthquakes are the main natural hazard. Environmental issues include deforestation, air pollution from metallurgical plants, limited sites for disposing urban waste, water shortages, and destruction of infrastructure in the 1992-1995 war. The nation's capital and largest city is Sarajevo, seated between several high mountains. With an estimated population of 304,136 in 2006, it is also the capital of the Federation of Bosnia and Herzegovina entity, and the legal capital of the Republika Srpska entity, as well as the center of the Sarajevo Canton. 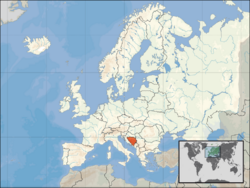 Other cities include Banja Luka, Sanski Most, Cazin, Velika Kladisa and Bihać, all in the northwest region known as Bosanska Krajina, Bijeljina and Tuzla in the northeast, Zenica in the central part of Bosnia, and Mostar, the capital of Herzegovina. Bosnia has been inhabited at least since Neolithic times. In the early Bronze Age, the Neolithic population was replaced by more warlike Indo-European tribes known as the Illyrians. Celtic migrations in the fourth and third centuries B.C.E. displaced many Illyrian tribes, but some Celtic and Illyrian tribes mixed. Conflict between the Illyrians and Romans started in 229 B.C.E., but Rome would not complete its annexation of the region until 9 C.E. In the Roman period, Latin-speaking people from all over the Roman Empire settled among the Illyrians and Roman soldiers were encouraged to retire there. Following the split of the Roman Empire between 337 and 395, Dalmatia and Pannonia became parts of the Western Roman Empire. Some claim that the region was conquered by the Ostrogoths in 455. It subsequently changed hands between the Alans and Huns. By the sixth century, Emperor Justinian had reconquered the area for the Byzantine Empire. Bosnia during the tenth century. Bihaćka kula in the City of Bihać ("the tower of Bihać"). Avars pushed the Slavs from Eastern Europe (Russia) to the Balkan region during the sixth century. A second wave of Slavs in the seventh century included two powerful tribes, the Croats and the Serbs. Croats covered most of central, western, and northern Bosnia, while Serbs extended into the Drina River valley and modern Herzegovina. The Slavs brought a tribal social structure. Charlemagne's Franks conquered part of northwestern Bosnia during the late eighth and early ninth centuries, causing Slavic tribal structure to give way to feudalism. It was around this time that the south Slavs were Christianized. Bosnia, due to its geographic position and terrain, was probably one of the last areas to go through this process. The principalities of Serbia and Croatia split control of Bosnia and Herzegovina in the ninth and tenth century. Tomislav I, who reigned from 910 until 928, was one of the greatest rulers of Croatia in the Middle Ages. After his death in 928, a Serb princedom that acknowledged the sovereignty of the Byzantine Empire took over much of Bosnia. The first preserved mention of the name "Bosnia" is in the De Administrando Imperio, a politico-geographical handbook written by the Byzantine emperor Constantine VII in 958, who says that Bosnia was a geographical part of the populated "Baptized Serbia." During the eleventh and twelfth centuries, political circumstance led to the area being contested between the Kingdom of Hungary and the Byzantine Empire. 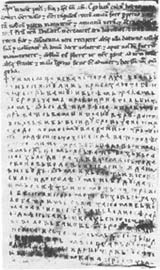 The Charter of Kulin Ban - treatiy with Dubrovnik. Now in Ermitrage in Petersburg. Kulin Ban's plate found in Biskupići, near Visoko. After the emperor Manuel I Comnenus died in 1180, a territory excluding much of modern Bosnia and all of Herzegovina became an independent state under the rule of local bans and existed from 1180 to 1463. The state existed despite aggression from the neighboring kingdom of Hungary, which maintained a claim to sovereignty. The first notable Bosnian monarch, Ban Kulin (1180–1204), presided over nearly three decades of peace and stability during which he strengthened the country's economy through treaties with Dubrovnik and Venice. His rule also marked the start of a controversy with the Bosnian Church, an indigenous Christian sect considered heretical by both the Roman Catholic and Eastern Orthodox churches. In response to Hungarian attempts to use church politics to reclaim sovereignty over Bosnia, Kulin held a council of local church leaders to renounce the heresy and embrace Catholicism in 1203. Despite this, Hungarian ambitions remained unchanged long after Kulin's death in 1204, waning only after an unsuccessful invasion in 1254. Under Ban Stjepan Kotromanic (1322–53), Bosnia expanded south, incorporating the principality of Hum (modern Herzegovina), and under King Tvrtko I (1353–91), Bosnia expanded further south, acquired a portion of the Dalmatian coast, and was briefly the most powerful state in the western Balkans. A power struggle between the Šubić and Kotromanić families marked Bosnian history until the early fourteenth century. This conflict came to an end in 1322, when Stjepan II Kotromanić (1322–1353) became ban. By the time of his death in 1353, he had annexed territories to the north and west, as well as Zahumlje and parts of Dalmatia. 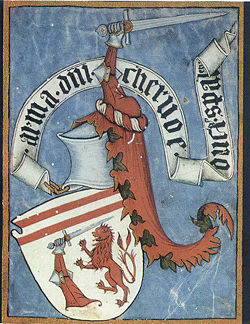 He was succeeded by his nephew King Tvrtko I (1353–1391), who, following a prolonged struggle with nobility and inter-family strife, gained full control of the country in 1367. Tvrtko crowned himself on October 26, 1377 as Stefan Tvrtko I by the mercy of God King of Serbs, Bosnia and the Seaside and the Western Lands. Following his death in 1391 however, Bosnia fell into a long period of decline. Tvrtko's successor, King Ostoja, struggled against Tvrtko's illegitimate son, Tvrtko II, who was supported by the Turks and then by the Hungarians. The Ottoman Empire had already started its conquest of Europe and posed a threat to the Balkans throughout the first half of the fifteenth century. The nobleman Stefan Vukcic established his own rule over Hum and gave himself the title herceg (duke), from which the name Herzegovina is derived. The Ottoman province of Bosnia in the seventeenth century. Turkish forces captured the settlement of Vrhbosna (which later became Sarajevo) in central Bosnia in 1448, and in 1463 conquered the rest of Bosnia proper, although parts of Herzegovina and northern Bosnia were taken over by Hungary. Herzegovina would follow in 1482, with a Hungarian-backed reinstated "Bosnian Kingdom" being the last to succumb in 1527. The Ottoman conquest brought tremendous changes in the political and cultural landscape of the region. Although the kingdom had been crushed and its high nobility executed, the Ottomans nonetheless preserved Bosnia's identity by incorporating it as a province of the Ottoman Empire with its name and territorial integrity - a unique case among subjugated states in the Balkans. Within this sandžak (and eventual vilayet) of Bosnia, the Ottomans distributed land according to the Ottoman feudal system. The holder of a timar (estate) had to report for military duty, bringing other soldiers. Taxes were imposed, including the harac, a graduated poll tax on non-Muslims. The system called devsirme was introduced, under which Christian children were taken for training in the elite Janissary corps. Bosnia's population make-up changed several times as a result of the empire's conquests, frequent wars with European powers, migrations, and epidemics. Bosnia differed from the other Balkan lands (except Albania) in that a large part of the Slavic-speaking population converted to Islam to become the largest of the ethno-religious groups. Also, a significant number of Sephardi Jews arrived following their expulsion from Spain in the late fifteenth century during the Spanish Inquisition. The Bosnian Franciscans (and the Catholic population as a whole) were protected by official imperial decree, although these guarantees were often disregarded and their numbers dwindled. The Orthodox community, initially confined to Herzegovina and Podrinje, spread throughout the country during this period and prospered until the nineteenth century. Meanwhile, the schismatic Bosnian Church disappeared altogether. The city castle of Gradačac. 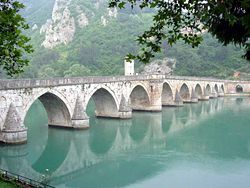 The Višegrad bridge crossing the river Drina, built during the Ottoman Era. As the Ottoman Empire expanded into Central Europe, Bosnia was relieved of the pressures of being a frontier province and went through a prolonged period of prosperity. 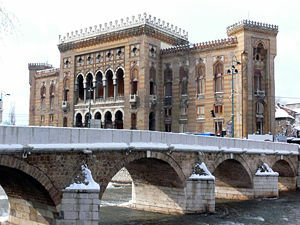 A number of cities, such as Sarajevo and Mostar, were established and grew into regional centers of trade and urban culture. Within these cities, various Sultans and governors financed the construction of many important works of Bosnian architecture (such as the Stari most bridge and Gazi Husrev-beg's Mosque). Bosnian soldiers formed a large component of the Ottoman ranks in the battles of Mohács and Krbava field, two decisive military victories, while numerous other Bosnians rose through the ranks to become admirals, generals, and grand viziers. Other Bosnians emerged as mystics, scholars, and celebrated poets in the Turkish, Arabic, and Persian languages. However, by the conclusion of the Great Turkish War with the treaty of Karlowitz in 1699 once again Bosnia became the Ottoman Empire's westernmost province. The following 100 years were marked by military failures, numerous revolts within Bosnia, and several outbursts of plague. The Porte's efforts at modernizing the Ottoman state were met with great hostility in Bosnia, where local aristocrats stood to lose much. This, combined with frustrations over political concessions to nascent Christian states in the east, culminated in a famous (unsuccessful) revolt by Husein Gradaščević in 1831. Related rebellions would be extinguished by 1850, but agrarian unrest eventually sparked the Herzegovinian rebellion, a widespread peasant uprising, in 1875. The conflict spread and came to involve several Balkan states and Great Powers, which eventually forced the Ottomans to cede administration of the country to Austria-Hungary through the treaty of Berlin in 1878. Though an Austro-Hungarian occupying force quickly subjugated initial armed resistance upon take-over, tensions remained in certain parts of the country (particularly Herzegovina) and a mass emigration of predominantly Muslim dissidents occurred. With the aim of establishing the province as a stable political model that would help dissipate rising South Slav nationalism, Habsburg rule gradually did much to codify laws, introduce new political practices, and modernize. A public works program was initiated, mines and factories developed, and agriculture was promoted with model farms and training colleges. 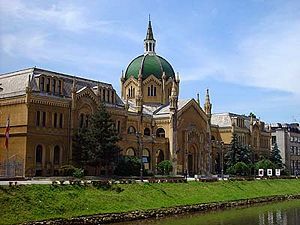 Three high schools and nearly 200 primary schools were built, as were the three Roman Catholic churches in Sarajevo. Although successful economically, Austro-Hungarian policy - which focused on advocating the ideal of a pluralist and multi-confessional Bosnian nation (largely favored by the Muslims) - failed to curb the rising tides of nationalism. The concept of Croat and Serb nationhood had already spread to Bosnia and Herzegovina's Catholics and Orthodox communities from neighboring Croatia and Serbia in the mid nineteenth century, and was too well-entrenched to allow for the widespread acceptance of Bosnian nationhood. By the latter half of the 1910s, nationalism was an integral factor of Bosnian politics, with national political parties corresponding to the three groups dominating elections. The idea of a unified South Slavic state (typically expected to be spear-headed by independent Serbia) became a popular political ideology in Bosnia and Herzegovina. The Austro-Hungarian government's decision to formally annex Bosnia-Herzegovina in 1908 added to a sense of urgency among these nationalists. The First Balkan War (1912–1913), in which Serbia expanded south, driving Turkish forces out of Kosovo, Novi Pazar, and Macedonia, heightened tension. In May 1913, the military governor of Bosnia declared a state of emergency, dissolved the parliament, and suspended civil courts. The political tensions culminated on June 28, 1914, when Serb nationalist youth Gavrilo Princip assassinated the heir to the Austro-Hungarian throne, Archduke Franz Ferdinand, in Sarajevo, an event that proved to be the spark that set off World War I. Although some Bosnians died serving in the armies of the various warring states, Bosnia and Herzegovina itself managed to escape the conflict relatively unscathed. 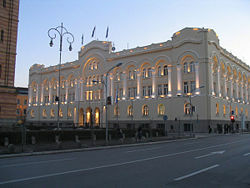 The building of the Assembly of the City of Banja Luka. The Kingdom of Serbs, Croats and Slovenes (the Kingdom of Yugoslavia) was born out of the Treaty of Versailles in 1919. Political life in Bosnia at this time was marked by two major trends: social and economic unrest over property redistribution, and formation of several political parties that frequently changed coalitions and alliances with parties in other Yugoslav regions. Bosnia's major ethnic groups approached the dominant ideological conflict between Croatian regionalism and Serbian centralization differently. Even though there were over three million Bosnians in Yugoslavia, outnumbering Slovenes and Montenegrins combined, Bosnian nationhood was denied. Although the split of the country into 33 oblasts erased the presence of traditional geographic entities from the map, the efforts of Bosnian politicians such as Mehmed Spaho (1883-1939), an influential Bosniak political figure, ensured that the six oblasts carved up from Bosnia and Herzegovina corresponded to the six sanjaks from Ottoman times and, thus, matched the country's traditional boundary as a whole. The establishment of the Kingdom of Yugoslavia in 1929, however, brought the redrawing of administrative regions into banates that purposely avoided all historical and ethnic lines, removing any trace of a Bosnian entity. Serbo-Croat tensions over the structuring of the Yugoslav state continued. The famous Cvetković-Maček agreement that created the Croatian banate in 1939 encouraged what was essentially a partition of Bosnia between Croatia and Serbia. However, outside political circumstances forced Yugoslav politicians to shift their attention to the rising threat posed by Adolf Hitler's Nazi Germany. Following a period that saw attempts at appeasement, the signing of the Tripartite Pact (in 1940 by Imperial Japan, Nazi Germany, and Fascist Italy), and a coup d'état, Yugoslavia was finally invaded by Germany on April 6, 1941. 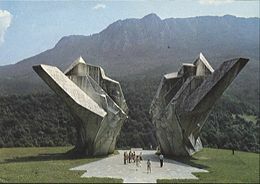 Monument commemorating the Battle of Sutjeska in eastern Bosnia and Herzegovina. 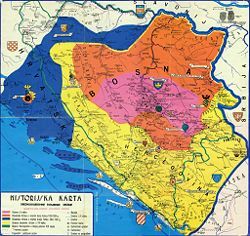 Once Nazi forces conquered the kingdom of Yugoslavia in World War II, all of Bosnia was ceded to the Independent State of Croatia. Nazi rule over Bosnia led to widespread persecution of Jewish, Serbian and Gypsy civilians. The Jewish population was nearly exterminated, and 129,114 Serbs died as a result of genocide perpetrated by the Croatian Ustasha in the Independent State of Croatia. An incomplete list of victims of the 1941-1945 war, is kept in the Federal Bureau of Statistics in Belgrade. It contains the names of 179,173 persons killed in the war born in Bosnia and Herzegovina. The list confirms that the Serbian population had the greatest losses. The war victims in Bosnia and Herzegovina were 72.1 percent Serbs (129,114), 16.5 percent Muslims (29,539), 4.4 percent Croats (7850) and 7.0 percent of other nationalities. Many Serbs in the area took up arms and joined the Chetniks; a Serb nationalist and royalist resistance movement that conducted guerrilla warfare against the Nazis but then switched to fight the Partisans. Starting in 1941, Yugoslav communists under the leadership of Josip Broz Tito organized their own multi-ethnic resistance group, the partisans, who fought against both Axis and Chetnik forces. On November 25, 1943, the Anti-Fascist Council of National Liberation of Yugoslavia with Tito at its helm held a founding conference in Jajce where Bosnia and Herzegovina was reestablished as a republic within the Yugoslavian federation in its Ottoman borders. Military success eventually prompted the Allies to support the Partisans, but Josip Broz Tito declined their help. After the war, the constitution of 1946 officially made Bosnia and Herzegovina one of the six constituent republics of the Socialist Federal Republic of Yugoslavia. 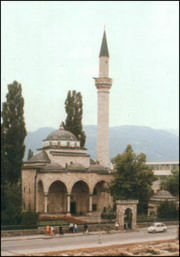 Bosnia underwent the social, economic, and political changes that the new communist government imposed on Yugoslavia, but Bosnia was uniquely affected by the abolition of traditional Muslim Qur'anic primary schools, rich charitable foundations, and dervish religious orders. However, by 1968 Muslims were deemed a distinct nation, by 1971 Muslims formed the largest single component of the Bosnian population, and in the 1991 census Muslims made up more than two-fifths of the Bosnian population. From the mid-1990s, the term Bosniak had replaced the term Muslim. Because of its central geographic position within the Yugoslavian federation, post-war Bosnia was strategically selected as a base for the development of the military defense industry. This contributed to a large concentration of arms and military personnel in Bosnia; a significant factor in the war that followed the break-up of Yugoslavia in the 1990s. However, Bosnia's existence within Yugoslavia, for the large part, was peaceful and prosperous. Though considered a political backwater of the federation for much of the 50s and 60s, the 70s saw the ascension of a strong Bosnian political elite fueled in part by Tito's leadership in the non-aligned movement and Bosniaks serving in Yugoslavia's diplomatic corps. While working within the communist system, politicians such as Džemal Bijedić, Branko Mikulić and Hamdija Pozderac reinforced and protected the sovereignty of Bosnia and Herzegovina. In 1980, after Tito's death, the presidency of the subsequent communist regime rotated between representatives of each of the six republics and two provinces. This system contributed to growing political instability, and the rapid decline of the Yugoslav economy, which in turn added to widespread public dissatisfaction with the political system. A crisis in Kosovo, the emergence of Serb nationalist Slobodan Milošević (1941-2006) in Serbia in 1986, and the manipulation of nationalist feelings by politicians, further destabilized Yugoslav politics. Independent political parties appeared in 1988. In 1989, Milosevic, with his vision of a "Greater Serbia" free of all other ethnicities, won the presidency in Serbia. In early 1990, multiparty elections were held in Slovenia and Croatia. After in Bosnia and Herzegovina's first multi-party elections in November 1990, the Bosniak Party of Democratic Action, the Serbian Democratic Party and the Croatian Democratic Union formed a coalition government, led by Bosniak politician Alija Izetbegovic. But growing tension, both within and outside Bosnia, made cooperation with Radovan Karadzic's Serbian Democratic Party increasingly difficult. Croatia and Slovenia's subsequent declarations of independence and the warfare that ensued placed Bosnia and Herzegovina and its three constituent peoples in an awkward position. A rift developed on the issue of whether to stay with the Yugoslav federation (overwhelmingly favored among Serbs) or seek independence (favored among Bosniaks and Croats). Bosnia and Herzegovina declared its sovereignty in October of 1991. 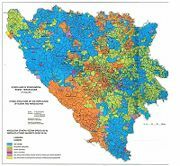 In 1991, several “Serb Autonomous Regions,” and two Croat “communities” were declared in areas of Bosnia with large Serb populations. Croatian president Franjo Tudjman and the Serbian president Slobodan Miloševic had discussed the possibility of partitioning Bosnia that year. The Serbian Democratic Party began boycotting the Bosnian presidency meetings from August in protest, and in October, it left the Bosnian assembly and set up a “Serb National Assembly” in Banja Luka. The assembly organized a referendum on independence in March 1992, after most Bosnian Serb members had quit. The Bosnian Serb assembly members asked the Bosnian Serb population to boycott the referendum held on February 29 and March 1, 1992. The turnout in the referendum was 64-67 percent and the vote was 98 percent in favor of independence. Independence was declared on March 5, 1992. The referendum failed to pass the constitutionally required two-thirds majority, so legally it failed, causing controversy. The referendum and the murder of a member of a wedding procession on the day before the referendum was utilized by the Bosnian Serb political leadership as a reason to start road blockades in protest. The Bosnian War followed. 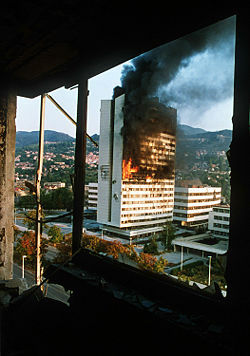 The parliament building in the centre of Sarajevo burns after being hit by tank fire during the siege in 1992. Following a tense period of escalating tensions and sporadic military incidents, open warfare began in Sarajevo on April 6, 1992. The Serb army forced Muslims out of northern and eastern Bosnia, the areas nearest to Serbia, in a process called "ethnic cleansing." Serbs destroyed villages and systematically raped Bosnian women—entire villages at a time. International recognition of Bosnia and Herzegovina increased diplomatic pressure for the Yugoslav People's Army (JNA) to withdraw from the republic's territory which they officially did. 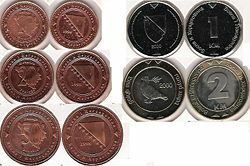 However, in fact, the Bosnian Serb members of JNA simply changed insignia, formed the Army of Republika Srpska, and continued fighting. Armed and equipped from JNA stockpiles in Bosnia, supported by volunteers and various paramilitary forces from Serbia, and receiving extensive humanitarian, logistical and financial support from the Federal Republic of Yugoslavia, Republika Srpska's offensives in 1992 managed to place much of the country under its control. By 1993, when an armed conflict erupted between the Sarajevo government and the Croat statelet of Herzeg-Bosnia, about 70 percent of the country was controlled by Republika Srpska. In March 1994, the signing of the Washington accords between the leaders of the republican government and Herzeg-Bosnia led to the creation of a joint Bosniak-Croat Federation of Bosnia and Herzegovina. The signing of the Dayton Agreement in Paris on December 14, 1995, by the presidents of Bosnia and Herzegovina (Alija Izetbegović), Croatia (Franjo Tuđman), and Yugoslavia (Slobodan Milošević) brought a halt to the fighting, roughly establishing the basic structure of the present-day state. The 1992-1995 war left around 100,000 to 110,000 dead and 1.8 million displaced. The Bosnian government charged Serbia of complicity in genocide in Bosnia during the war at the International Court of Justice (ICJ). In its verdict (2007), the Court found that Serbia had not committed, or conspired to commit genocide. It also dismissed Bosnian claims that genocide has been committed on the whole territory of Bosnia and Herzegovina. It did, however, find that Serbia had violated the obligation under the Genocide Convention to prevent the specific instance of genocide that occurred at Srebrenica in 1995. Bosnia and Herzegovina's government building. The system of government set up by an agreement negotiated in Dayton, Ohio, U.S., in November 1995, established Bosnia and Herzegovina as an emerging federal democratic republic. The system of government is an example of consociationalism, as representation is by elites who represent the countries' three major groups, with each having a guaranteed share of power. Bosnia and Herzegovina is divided into two entities - the Federation of Bosnia and Herzegovina and the Republika Srpska, as well as the district of Brčko. Each entity has its own legislature and president. The central institutions of Bosnia and Herzegovina include a directly elected tripartite presidency with one Bosniac, one Serb, and one Croat member. The presidency rotates among three members (Bosniak, Serb, Croat), each elected for an eight-month term within their four-year term as a member. The three members of the presidency are elected directly by the people (Federation votes for the Bosniak/Croat, Republika Srpska for the Serb). The presidency appoints a multiethnic Council of Ministers with one Bosniac and one Serb co-chairman, rotating weekly, and one Croat vice-chairman, who are approved by the House of Representatives. The co-chairmen are responsible for appointing a Foreign Minister, Minister of Foreign Trade, and others as appropriate. The parliamentary assembly, the lawmaking body, consists of two houses: the House of Peoples and the House of Representatives. The House of Peoples includes 15 delegates, two-thirds of whom come from the Federation (five Croat and five Bosniaks) and one-third from the Republika Srpska (five Serbs). The House of Representatives is composed of 42 Members, two-thirds elected from the Federation and one-third elected from the Republika Srpska. There is a multi-party system, and suffrage is universal to those age 18 and over. However, the highest political authority in the country is the High Representative in Bosnia and Herzegovina, the chief executive officer for the international civilian presence in the country. Since 1995, the High Representative was able to bypass the elected parliamentary assembly or to remove elected officials. The methods selected by the High Representative are often seen as dictatorship. 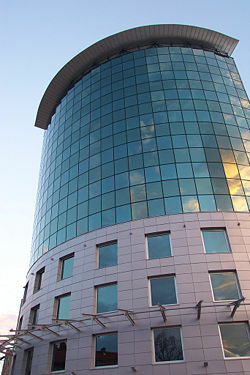 The Constitutional Court of Bosnia and Herzegovina is the supreme, final arbiter of legal matters. It is composed of nine members: four members are selected by the House of Representatives of the Federation, two by the Assembly of the Republika Srpska, and three by the President of the European Court of Human Rights after consultation with the Presidency. The State Court of Bosnia and Herzegovina consists of three divisions - Administrative, Appellate and Criminal - having jurisdiction over cases related to state-level law and appellate jurisdiction over cases initiated in the entities. A War Crimes Chamber was added in January 2005. The State Court also deals with organized crime, economic crime and corruption cases. The Human Rights Chamber for Bosnia and Herzegovina was active between March 1996 and December 2003. It was a judicial body established under Annex 6 to the Dayton Peace Agreement. Bosnia and Herzegovina comprises the Federation of Bosnia and Herzegovina (FBiH), Republika Srpska (RS), and Brčko District (BD). The Federation of Bosnia and Herzegovina consists of ten cantons. Bosnia and Herzegovina has several levels of political structuring under the federal government level. Most important is the division of the country into Republika Srpska, which covers around 49 percent of Bosnia and Herzegovina's total area, and the Federation of Bosnia and Herzegovina, which covers some 51 percent. The entities were based largely on the territories held by the two warring sides at the time, were formally established by the Dayton peace agreement in 1995. The Brčko federal district in the north of the country was created in 2000 out of land from both entities. It officially belongs to both, but is governed by neither, and functions under a decentralized system of local government. The third level comprises ten cantons, each of which have their own cantonal government. Some cantons are ethnically mixed and have special laws implemented to ensure the equality of all constituent peoples. Municipalities make up the fourth level of political division. The Federation of Bosnia and Herzegovina is divided in 74 municipalities, and Republika Srpska in 63. Municipalities also have their own local government, and are typically based around the most significant city or place in their territory. Bosnia and Herzegovina has four "official" cities. These are: Banja Luka, Mostar, Sarajevo, and East Sarajevo. The territory and government of the cities of Banja Luka and Mostar corresponds to the municipalities of the same name, while the cities of Sarajevo and East Sarajevo officially consist of several municipalities. Cities have their own city government whose power is in between that of the municipalities and cantons (or the entity, in the case of Republika Srpska). 200 KM (Convertible Mark) bill. The Convertible Mark is Bosnia and Herzegovina's currency. Bosnia and Herzegovina ranked next to Macedonia as the poorest republic in the old Yugoslav federation. Although agriculture is almost all in private hands, farms are small and inefficient, and the republic traditionally is a net importer of food. The private sector is growing and foreign investment is slowly increasing, but government spending, at nearly 40 percent of adjusted GDP, remains unreasonably high. Yugoslavia's foreign debt and rampant inflation reduced the standard of living in Bosnia and Herzegovina in the 1980s. Yugoslav President Josip Broz Tito had pushed the development of military industries in the republic with the result that Bosnia was saddled with a host of industrial firms with little commercial potential. The interethnic warfare in Bosnia caused production to plummet by 80 percent from 1992 to 1995 and unemployment to soar. Hikes in the price of oil, falling imports and exports, hyperinflation, shortages of food and medicine, insolvent banks, and unpaid pensions stimulated a black market. With an uneasy peace in place, output recovered in 1996-1999 at high percentage rates from a low base; but output growth slowed in 2000-2002. Part of the lag in output was made up in 2003-2006 when GDP growth exceeded 5 percent per year. Bosnia faces the dual problem of rebuilding a war-torn country and introducing market reforms to its formerly centrally-planned economy. One legacy of the previous era is a greatly overstaffed military industry; under former leader Tito, military industries were promoted in the republic, resulting in the development of a large share of Yugoslavia's defense plants but fewer commercially viable firms. National-level statistics are limited and do not capture the large share of black market activity. The konvertibilna marka (convertible mark or BAM)- the national currency introduced in 1998 - is pegged to the euro, and confidence in the currency and the banking sector has increased. Implementing privatization, however, has been slow, particularly in the Federation, although it is increasing in the Republika Srpska. Banking reform accelerated in 2001 as all the Communist-era payments bureaus were shut down; foreign banks, primarily from Western Europe, now control most of the banking sector. A sizable current account deficit and high unemployment rate remain the two most serious economic problems. On January 1, 2006, a new value-added tax (VAT) went into effect. The VAT has been successful in capturing much of the gray market economy and has developed into a significant and predictable source of revenues for all layers of government. The question of how to allocate revenue from VAT receipts has not been resolved. Bosnia and Herzegovina became a member of the Central European Free Trade Agreement in December 2006. The country receives substantial reconstruction assistance and humanitarian aid from the international community but will have to prepare for an era of declining assistance. Political corruption is one of the more acute problems in Bosnia and Herzegovina, and the main one that accounts for low amount of tax money used for the population, due to government inefficiency and corruption, especially at the lowest levels. Neum, on the Bosnian-Herzegovinian coastline. The tourism sector has been recovering and helping the economy altogether in the process, with popular winter skiing destinations as well as summer countryside tourism. An estimated 500,000 tourists visit Bosnia and Herzegovina every year and contribute much of the foreign currency in the country. Of particular note is the diaspora population which often returns home during the summer months, bringing in an increase in retail sales and food service industry. Tourist arrivals have grown by an average of 24 percent annually from 1995 to 2000 (360,758 in 2002, 500,000 in 2006). Exports totaled $3.5-billion in 2006. Export commodities included metals, clothing, and wood products. Export partners included Croatia 19.8 percent, Slovenia 16.9 percent, Italy 15.5 percent, Germany 12.4 percent, Austria 8.8 percent, Hungary 5.3 percent. Imports totaled $8.25 billion in 2006. Import commodities included machinery and equipment, chemicals, fuels, and foodstuffs. Import partners included Croatia 24 percent, Germany 14.5 percent, Slovenia 13.2 percent, Italy 10 percent, Austria 5.9 percent, and Hungary 5.2 percent. Per capita GDP (purchasing power parity) was estimated at $5600 in 2006, or 99th on the World Fact Book's list of 194 countries. Unemployment rate was officially 45.5 percent in 2004, although the grey economy may reduce actual unemployment to 25-30 percent. In that year, 25 percent lived below the poverty line. Around 4.3 million people lived in Bosnia and Herzegovina in 1991, before the 1992–1995 war, while in 2007 its population was estimated at four million. No census has been taken since 1991, and none is planned due to political disagreements. Therefore, almost all of the post-war data is an estimate. Life expectancy at birth for the total population was estimated at 78 years in 2006. Large population migrations during the Yugoslav wars in the 1990s have caused a large demographic shift in the country. Regardless of ethnicity, a citizen of Bosnia and Herzegovina is often identified in English as a Bosnian. In Bosnia however, the distinction between a Bosnian and a Herzegovinian is maintained as a regional, rather than an ethnic distinction. According to the 1991 census, Bosnia and Herzegovina had a population of 4,377,053. Ethnically, 41.47 percent were Muslims by nationality, 33.21 percent Serbs, and 17.38 percent Croats, with 5.54 percent declaring themselves Yugoslavs. According to 2000 data from the CIA World Factbook, Bosnia and Herzegovina is ethnically 48 percent Bosniak, 37.1 percent Serb, 14.3 percent Croat, 0.6 percent "other." While the Balkan region has been characterized by volatile relations among local groups and with outside forces, Bosnia has had a long history of peaceful coexistence among its three main ethnic groups. Before 1990, intermarriage was common, as were mixed communities. However, Milosevic's extremist politics stirred latent distrust, and "ethnic cleansing" left millions dead, wounded, or homeless. There is a strong correlation between ethnic identity and religion in Bosnia and Herzegovina as is shown by the fact that 99 percent of Bosniaks are Muslim, 98 percent of Croats are Catholic whilst 99 percent of Serbs are Orthodox Christians. Tensions between the three constitutional peoples remain high in the country and often provoke political disagreements. According to the CIA World Factbook, 40 percent of population are (Sunni) Muslims, 31 percent are Orthodox Christians, 15 percent are Roman Catholics, and 14 percent are atheists or have other religious affiliation. Languages spoken are Bosnian, Croatian, and Serbian, all of which are south Slavic languages. The Bosnian language uses the Latin alphabet, although the Cyrillic alphabet was accepted during the time of former Yugoslavia, but seldom used since. Speakers of the Bosnian language are more linguistically homogenous than either Serbs or Croats, but failed to standardize their language in the nineteenth century. Likewise, Croatian uses the Latin script. Serbian is a standard version of the south Slavic Shtokavian dialect, and uses the Serbian Cyrillic alphabet. The distinction between the three languages has been described as a matter of identity politics. Turkish and Albanian are spoken by few. In Bosnia's patriarchal system, women are expected to be subservient to men. Tito's communist regime gave women complete civil and political rights, increasing educational and lifestyle opportunities. However, women are responsible for cooking, cleaning, and child rearing, and those who work outside the home have lower-paying and lower-status jobs than men. Since the civil war, men are more likely to work the few jobs available, and more women have returned to being housewives and mothers. Before the civil war, 40 percent of the marriages involved ethnically mixed couples, while since then, mixed marriages have become rare. Muslim polygamy was practiced in only one region but has died out. The traditional domestic unit often includes parents, grandparents, and young children, although war and life in refugee camps has disrupted this. Mixed families were torn apart, and family members were forced to choose between ethnic affiliation and family ties. Traditional inheritance passed from the father to the oldest son, although under communism it was legal for women to inherit property. Bosnians traditionally lived in Slavic zadruga, which were agricultural communities that ranged from a few to 100 related nuclear families, organized patriarchally with a male gospodar as the head. While zadruga no longer exist, the extended family is still important, especially in rural areas. Tito's government established state-run day-care centers for young children to enable mothers to work. The civil war devastated children, who witnessed atrocities, and who were targeted by snipers, especially in Sarajevo. 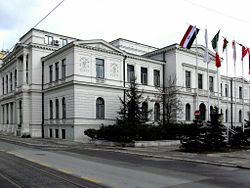 Academy of Fine Arts in Sarajevo. Primary education lasts for nine years. Secondary education is provided by general and technical secondary schools where studies last for four years. All forms of secondary schooling include an element of vocational training. Pupils graduating from general secondary schools obtain the Matura and can enroll in any faculty or academy by passing a qualification examination prescribed by the institution. Students graduating technical subjects obtain a Diploma. As part of the former Yugoslavia, Bosnia enjoyed a highly-developed educational system. Two of Bosnia’s natives were awarded Nobel Prizes: Vladimir Prelog, for chemistry in 1975, and Ivo Andrić, for literature in 1961. The war created a "brain drain" and resulted in many Bosnians working in high-tech, academic and professional occupations in North America, Europe and Australia. Only few of Bosnia's diaspora are returning to Bosnia and Herzegovina with their experience, Western education and exposure to modern business practices. Most still lack professional incentives to justify widespread and permanent return to their homeland. Bosnia's educational system with seven universities, one in every major city, plus satellite campuses, continues to turn out highly-educated graduates in maths, science and literature. However, they have not been modernized in last 15 years due to war, various political and economic reasons and as a result do not meet Western educational standards which are part of criteria for EU membership. The need for reform of current Bosnian education system is generally acknowledged although specific methods for its change have still not been formulated. In 2000, 96.7 percent of the total population age 15 and over could read and write. Before World War II, society consisted of a large class of peasants, a small upper class of government workers, professionals, merchants, and artisans, and an even smaller middle class. Communism brought education, rapid industrialization, and a comfortable lifestyle for most. The civil war created extreme differences between the rich and the poor, and left most of the population destitute. The architecture of Bosnia and Herzegovina falls into four major periods—medieval, Ottoman, Austro-Hungarian, and communist. Under the medieval Zadruga social system, families with common interests would live in clusters of Dinaric houses, which were simple structures build of natural materials (usually timber and wickerwork). Interior space was organized around the hearth in a central room with separate private quarters for men and women. Most military fortresses in Bosnia and Herzegovina were built between the twelfth and fifteenth century, and are promoted today as tourist attractions. Ottoman residences from the seventeenth century consisted of: a fence, a courtyard usually built of pebble or flat stone pattern for easier maintenance, an outdoor fountain (Šadrvan) for hygienic purposes, a lower level "semi-public" private space called the Hajat where the family would gather, and the Divanhan, an upper-level semi-private/private space used for relaxation and enjoyment. The bridge was a feature of Islamic architecture. The old bridge in Mostar (so called: Old Bridge) first built in 1566, with its arch over the river Neretva, is 95 feet (29 meters) long and 64 feet (19.5 meters) high. It was destroyed in 1993 and rebuilt. With a subtle parabola, it looks higher and more fragile than it is, an effect seen only in Gothic cathedrals. The Austrian Empire introduced a new building code that required building permits, like safety and fire protection requirements, regulated wall thickness and building heights. Stylistically, Bosnia was to be assimilated into the European mainstream. Communist Yugoslavia underwent industrialization that required an emphasis on development of public housing to accommodate people who migrated from rural to urban areas. In the 1930s, architects were influenced by ideas of functionalism, humane architecture and Bauhaus, which eliminated unnecessary decoration. 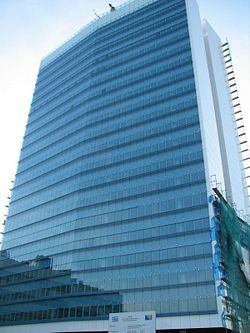 Commercial construction in the years following the Bosnian War has seen a boom in Sarajevo, which is one of the cities with the most construction in southeastern Europe. The Unis Twin Towers have been renovated completely. 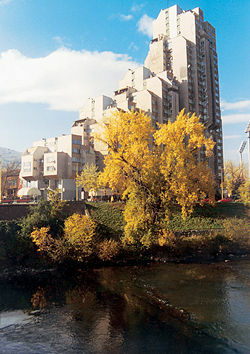 On the site of the former Oslobodjenje Towers, the Avaz towers have now been constructed. In the Hrasno residential area, the Bosnian Company Bosmal has constructed the "Bosmal City Center," which includes the tallest set of twin towers in the Balkans at 394 feet (120 meters) each. The oldest art work in Bosnia and Herzegovina is a Paleolithic painting in Badanj Cave, near the city of Stolac, representing the death of a horse under rain of arrows. Neolithic items have been found in Butmir, Bronze Age items were left by Illyrian Japods in Bihać and Daors in Daorson near Stolac. The Romans left roads, bridges, and beautiful villas with mosaics. 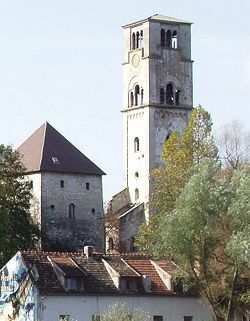 Christian basilicas are located at (Zenica, Visoko, Mostar, Široki Brijeg, among other places). 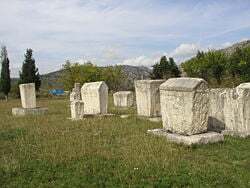 Bosnian Kingdom nobility were buried in large necropolises near roads, and the graves were marked by monumental tombstones called stećak (pronounced: Stee-chuck), which appear in Bosnia and Herzegovina, Croatia and western parts of Serbia. There are over 66,000 tombstones all over Bosnia and Herzegovina. They have been linked with the allegedly heretical Bosnian Church with motifs that are derived from their beliefs, with some derived from Romanesque (crosses, arcades with semi-circular arches, sun, half-moon etc.) and Gothic (arcades with sharp arches, knight riders, shields, swords, lilies). Illumination from manuscript of Hrvoje Vukčić Hrvatinić, Split, 1404. There are two beautiful illuminated manuscripts from medieval Bosnia. Hval’s missionary, kept in Zagreb, is ravishingly decorated manuscript with many miniatures. Misal Hrvoja Vukčića Hrvatinića - liturgical book of Bosnian duke and ruler of Dalmatia - Hrvoje Vukčić Hrvatinić, today in Istanbul, is colorfully painted with many details of knightly culture (knights, crests). Both were painted in Split, Croatia. Islamic Art flourished until nineteenth century, mainly as decorations within the numerous mosques, public fountains, public baths (hamam) and caravanserai motels built during that time. The arrival of the Austro-Hungarians in Bosnia brought a painting renaissance. The first artists educated in Europe academies appeared with the beginning of twentieth century. They include Atanasije Popović, Lazar Draljča, Gabrijel Jurkić, Branko Radulović, and Petar Šain, among others, who worked in academism with slight touches of impressionism, art nouveau, and pointillism. Post World War II artists include Virgilije Nevjestić, Bekir Misirlić, Ljubo Lah, Meha Sefić, Franjo Likar, Mersad Berber, Ibrahim Ljubović, Dževad Hozo, Affan Ramić, Safet Zec, Ismar Mujezinović, Mehmed Zaimović. Grilled meat is popular, as are cabbage-based dishes. Bosanski Lonac is a cabbage and meat stew. Typical ingredients are beef, lamb, cabbage, potatoes, tomatoes, carrots, parsley, garlic, pepper (whole, not in pieces), arranged in layers and cooked slowly in water or white wine. 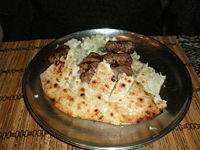 Cevapcici are lamb sausages that often are eaten with a flat bread called somun. Bosnian ćevapi from the Baščaršija district of Sarajevo and Banja Luka are probably the most famous ćevapi in the Balkans. 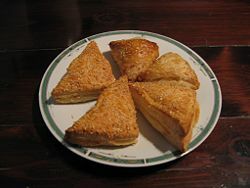 Pastries include burek and pida (layered cheese or meat pies), zeljanica (spinach pie), and sirnica (cheese pie), as well as baklava, a Turkish pastry layered with nuts and honey. Drinks include Kefir, a thin yogurt drink, Turkish coffee, and a tea called salep. Homemade brandy, called rakija, is popular. Bosniak director Emir Kusturica achieved international acclaim for his 1984 film When Father Went Away on Business, which was nominated for an Academy Award in the United States. Since the civil war, Kusturica's work has been condemned by Muslim authorities, and he has moved to Serbia. Other noted Bosnian film-makers are Mirza Idrizović, Aleksandar Jevdjević, Ivica Matić, Danis Tanović (oscar winner for his script of movie No Man's Land), Ademir Kenovic, Pjer Žalica, Dino Mustafić, Srdjan Vuletić. The Sarajevo Film Festival, founded in 1994, has become the biggest and most influential in southeast Europe. The Bosnian-Herzegovinian Film Festival is an annual event founded in 2003 and held in New York and since 2007 showcased at the Tribeca Cinema. Bosnia's literary tradition began with epic stories passed on orally with musical accompaniment. This art form persisted until the 1950s. Ivo Andric, a Serbian Catholic who was raised in Bosnia, won the Nobel Prize for Literature in 1961 for the historical novel Bridge over the Drina. Mesa Selimovic, another novelist, was raised a Muslim but proclaimed himself a Serbian writer. Literature since the civil war has consisted of non-fiction accounts of the war. One such work is Zlata's diary: a child's life in Sarajevo. Bosnia has poets such as Antun Branko Šimić, Aleksa Šantić, Jovan Dučić and Mak Dizdar, and writers including Meša Selimović, Branko Ćopić, Miljenko Jergović, Petar Kočić and Nedžad Ibrišimović. Bosnian music is a mixture of ethnic Bosniak, Croat, Serb, Greek, Roma (Gypsy), Turkish, Hungarian and Macedonian influences along with influences from the western part of the world. Traditional Bosnian and Herzogovinian songs are ganga, rera, using instruments like a bagpipe, wooden flute and sargija. The gusle, an instrument found throughout the Balkans, is also used to accompany ancient epic poems. From the Ottoman era comes sevdalinka. It is a kind of emotional folk song, typically led by a vocalist accompanied by the accordion along with snare drums, upright bass, guitars, clarinets or violins. Sevdalinka is a mixture of Turkish and Bosnian music, especially Muslim religious melodies called ilahije alongside Jewish songs like "Kad ja pođoh na Benbašu," the unofficial anthem of the city of Sarajevo. Bosnian composers of European classical music include Edin Dino Zonić, Mirsad (Giga) Jelesković, Ališer Sijarić, Igor Karača, and Goran Bregović. The National Theater, located in Sarajevo. The national theater was founded 1919 in Sarajevo and its first director was famous drama-play writer Branislav Nušić. 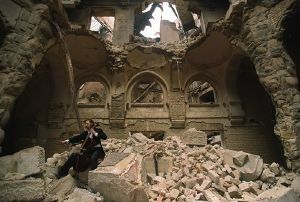 Sarajevo philharmonic orchestra was founded in 1923. From 1946 Sarajevo opera and Sarajevo Balet started; until year 2000, it had over 1000 theater shows and 300 ballets and operas. The Academy of Performing Arts in Sarajevo was founded in 1981. MESS is International theater festival founded during the war in 1992. Football (soccer) is the most popular sport in Bosnia-Herzegovina. The former Yugoslav national football team included famous Bosnian players, such as Josip Katalinski, Dušan Bajević, Ivica – Ćiro Blaževć, Ivica Osim, Safet Sušić, and Mirsad Fazlagić. Independent Bosnia and Herzegovina has not qualified for a European or World Championship. Bosnia-Herzegovina sportspeople have competed successfully at international level in handball, basketball, women’s basketball, karate, chess, and boxing. Sarajevo hosted the 14th Winter Olympics in February 1984. Culture of Bosnia and Herzegovina Countries and Their Cultures. Bosnia and Herzegovina CIA World Fact Book. Bosnia and Herzegovina Encyclopaedia Britannica. Bosnia and Herzegovina BBC Country Profiles. Bosnia and Herzegovina U.S. Department of State. History of "Bosnia and Herzegovina"
This page was last modified on 20 June 2016, at 18:19.